Keeping money in our community is the goal of the Port Clinton Area Chamber of Commerce. As a result of our Gift Certificate Program, over $10,000 was retained in the local business community last year. 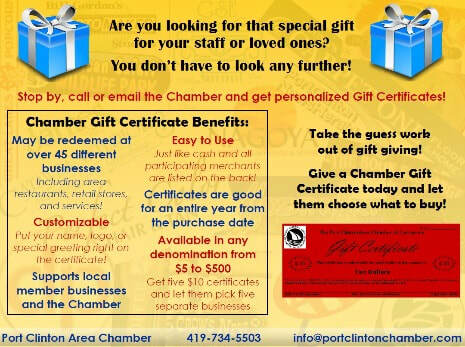 The Gift Certificate program at Port Clinton Area Chamber of Commerce began in 1997. These certificates are available to sell to the general public, but also the hope is that area employers choose the option to purchase these certificates in lieu of cash bonuses for holidays, awards, retirements, etc. Thereby keeping the dollars in the local business community. Only chamber members in good standing (dues paid) can be participating merchants. As a participating merchant, you accept these certificates as cash. The certificates are then redeemed in the Chamber office for the face amount less a 5% handling fee. Gift Certificates cannot be “cashed” in and the full amount is to be spent at ONE merchant premises. In other words, a $25 dollar Certificate cannot be used at two, three or four different merchants. No change is to be given back. The total amount is applied. Each certificate is numbered in the upper right corner above the dollar amount. The certificates are of several different colors, dependent on the denomination and occasion. Special certificates will be offered and designed to personalize your need. The certificates must be signed and dated by Nikki Adams, Nicole Kochensparger and Lauren Balduf. The certificate must be embossed with the Port Clinton Area Chamber of Commerce seal around the logo in the upper left corner. Do not accept EXPIRED certificates. "Living out state from my husband’s parents we have a hard time deciding on a gift that they would enjoy and find practical. Calling the local chamber of commerce we found they offered gift certificates that people can use to purchase groceries, go out to eat, pay a medical bill, etc. We always appreciate the excellent customer that we have always received from Tara at Port Clinton Chamber of Commerce. She will go above and behind mailing out the certificate to them directly instead of mailing them out of state and then I mailing them back to Ohio. Each time I or my husband talk with his parents they always compliment the ease of use with the gift certificates and the amount of stores or restaurants that are offered on the certificates. Perfect gifts for someone that has everyone that might want a quick bite to eat out or get a few groceries. Young and Old would love the ease of the certificates and the best part is each certificate is supporting a local business. Thank you Port Clinton Chamber of Commerce"